In November 1936 the prototype Fokker G.I heavy fighter was exhibited at the Paris Air Show, a static exhibition in the Grand Palais. The Fokker G.I, a twin-engined, two-seat aircraft which had been named “Le Faucheur” (The Reaper), had a role as a fighter/reconnaissance and light bomber-aircraft. After the Show, the G.I was taken to Eindhoven/Welschap airfield, from where its first flight was made on 16 March 1937. The G.1 made its maiden flight with two 750 hp Hispano-Suiza engines. The Aviation Department objected to the Hispano-Suiza engine because their other aircraft had been equipped with the Bristol Mercury. Moreover, the Hispano 80-02 was new and untried. The G.I engines were changed to similarly rated Pratt & Whitney SB4-G Twin Wasp Juniors during reconstruction, after the G.I suffered brake failure and rammed a hangar at Schiphol on 4 July 1937. Demonstrations had already been given to the Netherlands army air corps at Soesterberg, and considerable interest was shown, resulting at the end of the year in an order for 36 aircraft to be designated G.I Mercury. In order to ease the spares situation, it was stipulated that these must have Bristol Mercury VIII engines. This was a larger version with the armament of two 23mm can-non and two fixed 7.9mm machine guns, installed in the nose of the aircraft, and a rotatable 7.9mm machine gun in the tail, fitted in a kind of turret. The aircraft can also carry a 400kg bomb-load. Its maximum speed is 470km/hr and the radius of action is approximately 1,400km. There is a two-man crew. As a reconnaissance aircraft it has a range of 1,600km. The first production aircraft to fly, actually the second of the batch, became airborne only on 11 April 1939. It remained with the makers for production testing and modifications, and the first aircraft was delivered to Soesterberg on 10 July 1939.The G.1 Mercury was armed with a battery of eight 7.92-mm (0.312-in) machine-guns in the nose of the nacelle, plus another flexibly mounted at the rear, and could carry 300 kg (660 lb) of bombs. Twenty-three had been delivered by the time of the German invasion in May 1940, and although they fought well, when the fighting was over only one remained. This was flown to England by two escaping Fokker pilots. Export orders followed the aircraft's debut at Paris and a number of foreign pilots came to Fokker to fly and evaluate the G.I Mercury export version. Orders were placed by Finland (26), Estonia (9), Sweden (18) and Republican Spain (12), while a licence-production agreement was in negotiation with Denmark and another with Manfred Weiss in Hungary. The Dutch embargo on weapons exports before World War II killed the Spanish order and the Dutch Government took over the aircraft at the end of 1939, but the Finnish batch was under construction when war broke out and a ban was then placed on its export. After lengthy negotiations a contract was drawn up to permit the G.I Mercury's export on 17 April 1940, by which time 12 had been completed, apart from armament. By the time of the German invasion 12 of the Finnish G.I Mercurys and the nine confiscated Spanish machines were complete but the intended armament of two 23-mm (0.9-in) Madsen cannon and three 7.92-mm (0.312-in) machine-guns had not been fitted. When Germany attacked the Netherlands on 10 May 1940, 23 G.ls were in service: 12 with the 4th Fighter Group at Alkmaar and 11 with the 3rd Fighter Group at Rotterdam/Waalhaven. 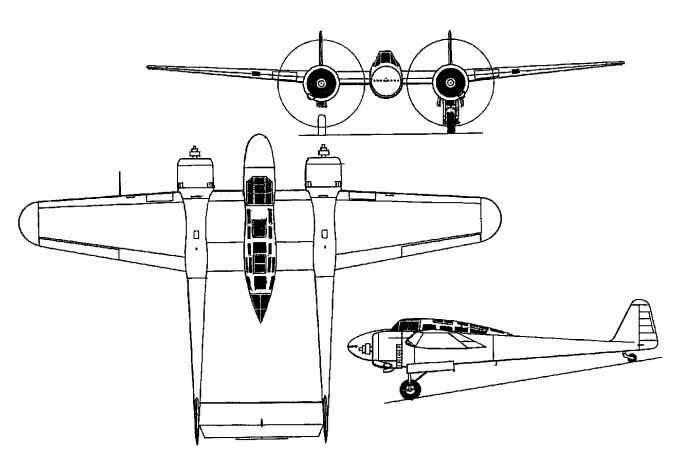 The G.ls were successful in destroying several Junkers Ju 52/3ms during the early stages of the German invasion, but by the fifth day, when Dutch resistance ended, only a single example remained airworthy. The Germans occupied the Fokker factory, ordering completion of the 12 G.ls intended for Finland, and these were used subsequently by the Luftwaffe as fighter trainers. Test flights from the factory were made under German supervision, but on 5 May 1941 two Dutch pilots succeeded in evading an escorting German-flown G.I and escaped to England. Their G.I Mercury was taken to the Royal Aircraft Establishment, Farnborough, for examination, and used subsequently by Phillips and Powis (Miles Aircraft) at Reading for research into wooden construction. A total of 62 G.ls is believed to have been built, and none survived the war. There never was a G.lA or a G.lB. They were officially clasified by Fokker as G.1 Wasp and G.l Mercury. Dutch air force referring to them as G.lW and G.lM. Engines: 2 x 750-hp Pratt & Whitney Twin Wasp Junior.